Chief Wilson hit 36 triples in 1912, when you could do that kind of thing, and now we will never have the tingling mid-June intuition that somebody just might break the single-season triples record. The broken-down flighty old remnant of our unconscious mind responsible for standing the hairs up on the back of our neck is not dumb enough to think somebody might hit 36 triples, even if it is not privy to the Baseball Reference page that says nobody has hit more than 23 since Armistice Day. Earl Webb is a jerk, but he's a jerk we can work with. Earl Webb hit 67 doubles in 1931, a season that saw American League teams average as many runs as they would the year Mark McGwire hit 65 homers. No one has hit more than 64 since then, and nobody has hit more than 60 since Ducky Joe Medwick hit 64 in 1936. Earl Webb never hit more than 30 before or after, which ought to be enough for people to at least read my screenplay, The Roger Maris of Doubles. But the part of the all-time leaderboard between 50 doubles in a season and 60 is full of guys who aren't dead, many of whom aren't even old enough to have nicknames that aren't just their name and then a "-y." Matt Carpenter's 55 in 2013 are the most anybody's hit since... well, since Brian Roberts in 2009. Todd Helton hit 59 in Coors Field in 2000, which is about as relevant to Matt Carpenter's situation as Earl Webb hitting 67 in 1931. As of Sunday morning, Matt Carpenter has seven doubles in 10 games; he had eight in 25 games in April of 2013, and at that year's all-star break was only on pace for 51. In the second half he gave us a clear look at the player he'd need to be to break Earl Webb's record. 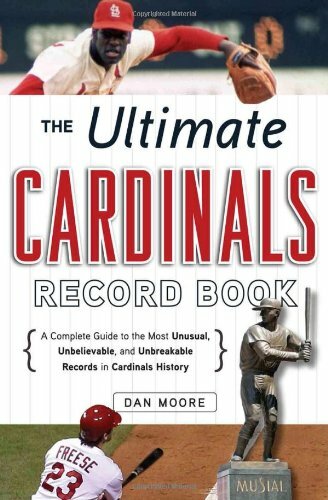 Playing in 68 of the Cardinals' 69 games he hit .313/.390/.459 with 27 doubles, a 162-game pace of 64. From August 1 forward he hit 23—that, finally, rounds up to 67 over a full season. Webb did it in 152 team games; he hit 16 in May, 18 in July, and 13 in September to pass 64, a record George Burns (not that one, or this one) had set all of five years earlier. Those three huge months leave us at the foot of the strange truth of the doubles record. To get close to it you have to be good but not too good; the players crowded near the top of the leaderboard are a mix of power hitters who were a year or two from blossoming into true sluggers and line-drive-hitting infielders in the midst of a career year. To actually reach it you have to be very good in a way that is, for most hitters, entirely unnatural. 43 percent of Webb's total bases that year were doubles; his career average was 30 percent. Carpenter's is 33 percent, topping out at 44 percent in that big second half. If you're going for the home run record there is not, in the back of your mind, the puzzling fear that you might be hitting too well to get it. If you're Matt Carpenter, you just might hit too many triples and home runs. It's a silly record, which makes it fun. It's held by a guy who is not an all-time great and challenged by guys who are also not all-time greats. No one is worried about the man who breaks the record cheapening the game of baseball or defaming the memory of the man who held the record before him. It is a good record to follow half-jokingly on a dumb graph. This is that dumb graph. 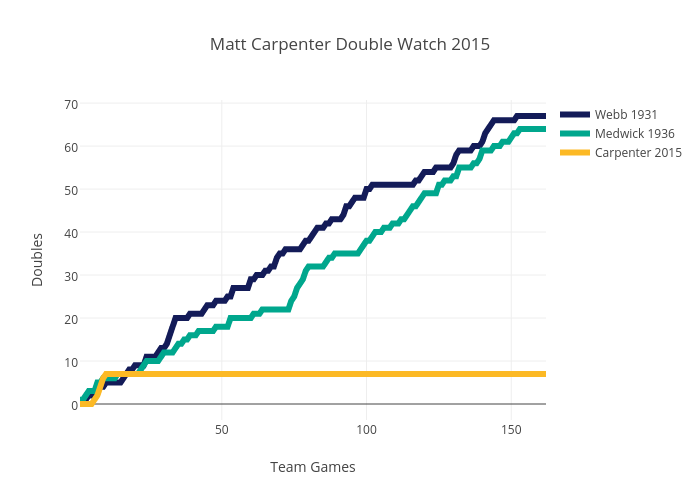 And here is where I'll be updating that dumb graph until well after Carpenter has fallen off the pace. The Ghost of Earl Webb doesn't have all that many places to haunt. Dave Fleming goes from Ed Delahanty to Manny Machado in a quick history of the doubles record. Bill James (behind a $3/month paywall) on the conditions for breaking the all-time doubles record existing "since about 1995."